Access control systems in Denver and the Metro Area are offered through Colorado Security Products, Inc. Part of the challenge of running a business is controlling access to restricted areas. If you are in retail, you don’t want customers behind the counter or in the stock room. As a manufacturer or health care provider, you want visitors and employees to be safe and not allowed to wander into restricted areas. With access control systems from our partner Kantech, Colorado Security Products will help you manage the flow of people no matter what type or size of business you have. We offer starter kits to protect a door or two that can expand as your business grows. By adding an optional Network Communication Controller, you can acquire functional PC-based networking that requires less PC support and maintenance. With our Kantech access control products, you can reduce workplace hazards by barring unauthorized personnel from dangerous areas, and it gives you an added bonus of having a handle on employee punctuality and attendance. 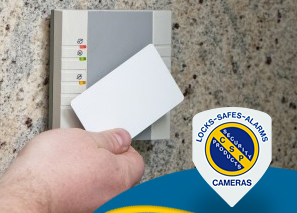 When you install a card or proximity reader near a door, employees can gain access with a mere swipe of the card. Whether you choose a vandal-resistant weatherized model for outdoor use or a sturdy indoor model, you will have a wide selection to choose from; all of which increase your security while being convenient for employees to use. When you want to limit who comes in yet permit customers and staff to exit freely, an electric door strike or electromagnetic lock can offer you the security you need. Whether you have expensive merchandise, financial records, or delicate equipment to protect, Colorado Security Products has an access control solution for you. Controlling access to areas of your building may also be managed with a simple Master Key solution. Keys issued to employees will only work in designated areas, so you can keep office personnel out of the warehouse and janitors out of the storeroom. As the manager or business owner, you will have access to all areas. The beauty of this system is that you can remove the core of the lock and easily change it if your staff changes or your assistant loses a key. You won’t even need to have new keys made to keep your security uncompromised. When you think access control in Denver, think Colorado Security Products, Inc. We can protect your business big or small with just the right solution. Contact us today at (303) 756-1000.